The ability to navigate is a vital skill for any mountain-goer. Many people tend to rely on GPS systems (either a dedicated unit, or a phone app), but these items are no real substitute for map and compass – and knowing how to use them. The reasons why map and compass are still the best tools for navigation are many – and a discussion on this would turn this post into a very different blog (maybe best kept for another day!) – so I am just going to focus on a rather ‘unusual’ reason why using a map over a GPS is better – a reason that is perhaps the antithesis of a process that is perceived to be a very much structural and logic based. Looking gloomy up high – but good for practising navigation! Navigation can be defined as: ‘the science of determining position, course, and distance travelled during a journey and hence advising on the best course to be steered or taken.’ Put very simply, while out in the mountains we calculate the time taken to travel from one location to the next by working out the distance and the amount of ascent. There are various formulae available to help us to do this, such as the famous Naismith’s rule. Micronavigation is applied over shorter distances, and we make use of strategies such as pacing distance. As you might expect, close study of features appearing on the map is required. How you make use of those features to get you from A to B and then eventually to your final goal is a fascinating exercise, one that usually has several route options and is a skill that can be developed – and refined – through experience. The ultimate test for any mountain navigator is to put these skills to the test in poor visibility or during hours of darkness. Compass bearings and pacing required here! To closely observe the landscape around you and to relate it to what the map shows you is the key to knowing where you are. It takes practice to do this – particularly while you’re chatting away, to be able to still be making note of what the ground is doing under your feet (‘there was a gradual gradient, then flattening out, and finally a very steep section…’) – and while this sounds like a chore, a distraction from enjoying your day of freedom in the hills, it actually encourages you to relate more intimately to your environment. It helps you to develop a very close understanding of the shape of the mountains, the approaches to them. It helps you to make sense of the landscape and what it really ‘means’. Routes start to make better sense. And as you become more connected to what is happening under your feet, you develop a better awareness of the many different mountain terrains that exist. You are more aware of the sequence of different sections of the route. The detailed observation of the landscape around you enhances the whole day. It’s almost a ‘mindfulness’ activity. Being in the here and now. Engaging with the landscape as you walk through it. Switching awareness between the far horizon, the mid ground and the foreground (and noting how the scope of horizon, mid ground and foreground is also affected by location and weather). Noting landmarks that are relevant and personal to you is almost like creating and memorising a secret trail. It is this walking with awareness that truly fosters the understanding of the mountain environment and also encourages deeper engagement with it. Once you observe the shape of the land through the medium of your feet (i.e., walking it), the map makes better sense. The photos that go with this post show that we had a very mixed day for our navigation work back in October. It was windy at first, but the wind speed significantly dropped as the day progressed. There was low cloud sweeping along and hiding the higher tops as we approached the col between Carn an t-Sagairt Beag and Carn an t-Sagairt Mor. Navigation in poor visibility was definitely the order of the day at first, but later the cloud lifted and we enjoyed some wonderful Autumn scenery. It wasn’t quite the full day of navigation in poor visibility that would have been desirable, but the views were more than worth paying the price for lack of low cloud base. After all, there’s always another day…. Out and about in Wester Ross. More navigation practice last week: out in the Glen Clova area … this time with not-so-good visibility up high (ideal for putting all those navigational techniques to the test) … and finishing with a hefty shower that started 20 minutes before we got back to the cars. After the last time (A Very Special Client), when the temperatures had soared to ridiculous levels, neither Joan, Harris the Dog or I were complaining! January 2018: I’m out in Glen Tanar, approximately 9km from the car park, up around 600m or so. It’s a January day, the temperature hovering around freezing. There’re some very hard snow patches around but the main issue for us is the icy surface of the track. I catch the front point of my right crampon as I’m going slightly downhill. I try to get the other foot through to stop the trip but because I’m on crampons it takes a split second longer to move the left foot (due to the weight, and the slightly ‘higher’ effect of being on spikes) and I’m not able to stop my fall. I come down on both knees, but the right knee bears the brunt of the fall onto the rocky, frozen ground. Probably one of the worst surfaces I could have picked. As I fall I twist (crampon falls are often twisting ones) and crash down, gravity and the weight of my winter-loaded rucksack driving and grinding the knee into the unkind surface. The pain is immediate and I roll (as best I can) onto my back in reaction to the impact. For a few seconds I lie there as my nerve network clocks what’s happened. My companion, who is slightly ahead, turns to see whether I’m alright. I try to get up but feel so sick and dizzy that I collapse back onto the track. After what seems like an age (but probably wasn’t) I drag myself backwards, to park my backside on the embankment at the side of the track and sit there. Failure to get up from where I’m sitting is simply not an option. I need to be able to walk out of this. ‘Broken knee cap, broken knee cap, broken knee cap’ goes through my mind like a chant. With effort I launch myself, find myself able to stand, and, miracles of miracles, my right knee takes my weight. 9km to the car, I tell myself. You have no choice. You’ll just have to do this. The knee has become a numb non-entity, but within 2km the pain is kicking in and the joint is swelling rapidly. July 2018: I have just returned from an ‘overnight’ mountain day in the Cairngorms. Nothing too unusual in that (Moonshadows and the Devil), but a landmark in my knee’s rehabilitation programme. Until now, I hadn’t really been able to contemplate a lengthy Cairngorm day, but finally I had built up fitness and had enough confidence in my knee to head a very long way from any road and any easy option/route out. Setting off at 10pm from Linn of Dee, we crossed the Lui, then, in the deepening twilight, followed the path through the narrow defile of Clais Fhearnaig. We joined the Glen Quoich track and crossed a very low Allt an Dubh-ghleann before starting the long climb up to the Beinn a’Bhuird plateau. February 2018: ‘You sports people are just so impatient,’ the GP curtly says to me. Three weeks later and the swelling is showing no signs of abating. If anything, it’s worse. I can barely move the leg on or off the bed, am shuffling up and downstairs on my backside and have a very strange lopsided sway when I attempt to walk. 8 weeks, I’m told, until this calms down – and then there are no guarantees that there’s no damage. A few weeks later, the physio suggests that there may be a problem with the medial ligament, possibly a tear, but nothing is confirmed. The joint is still too swollen for the experts to be able to work out what the damage is and whether a full recovery is feasible. By the end of the month, I’m going stir crazy with the enforced rest and decide to give the gym a go – very gentle, careful exercise, of course. I discover that I can hardly shift the cross trainer with my legs when it’s on level 0. Using my arms to get moving helps, in fact I end up dependent on them. A quiet yelp escapes every time my right leg moves round… perhaps this is just a tad too advanced for me right now… Meanwhile, Iain has clocked up some crazy mileage on his cross trainer, having forced himself to do some ridiculous pace, is bright red in the face, gasping for breath and virtually collapsing over the top of the machine. Any minute now the gym staff will call the paramedics … how I envy him…. July 2018: As overnight ventures go, this one was nothing short of spectacular. Being this far north we never had full darkness. The stars slowly appeared, pale silver pinpricks struggling to make themselves seen in the light summer night. Mars was clearly visible at one point, unmistakeable with its red glow. Towards the end of our sustained climb, the waning quarter moon appeared over the shoulder of the mountain and as we approached the edge of the Corrie, the mist was rising upwards, with pre- sunrise hues painting the North Eastern skies, while the lochans down below reflected the moonlight above. Over to the North Summit the colours grew more intense around us. A herd of deer grazing near the summit were certainly very startled to see us and moved off rapidly. The mist brewed and boiled down below in the glens and corries. The sunrise gradually progressed, the paler shades deepening and preparing for the stunning, red ball of fire that eventually lifted itself above the horizon. The moon started to lose its wonderful silvery sheen and the power of its light diminished as it became a whiter shadow of itself. March 2018: ‘You’ve been overdoing it again,’ my very astute physio says to me accusingly. ‘You MUST learn to pace yourself otherwise you’ll not allow the knee to recover.’ I thought I’d done quite well to hide the limp that morning. I’d recently been allowed to start horse riding once again, all good and fine … only I hadn’t just gone for a short hack that particular morning, oh no … I’d also limped my way at snail’s pace around a local mini forest walk, being rapidly overtaken by shuffling elderly Labradors who looked at me as if to say ‘Why on earth are you slower than us? Your problem is…?? ?’ and also a lady supported by two sticks who’d just had a double hip replacement (after I explained why I was so slow, she proceeded to tell me with great enthusiasm: ‘Oh yes, knee injuries are absolutely the worst to recover from.’). The result? One twinging, unhappy right knee. And one severe talking-to, which I totally deserved. July 2018: The wonderful experiences continued with the inversion that had firmly established itself with the high Cairngorm peaks visible above the clouds while the cliffs of the corrie were beautifully delineated in the glass clear early morning light. We reluctantly began our descent (the most testing part of the journey for my knee), feeling the warmth of the sun rapidly ramp up. A mountain hare abruptly sprang out of the grass: we had been so close to him that we could, for a brief second, see in detail his eyes, whiskers, nose and coat. Clearly a youngster, he raced off down the path ahead of us. The temperature was rapidly climbing and we gratefully dropped down into the cloud that was resting in the glen, making things far more bearable. This just left the walk out, with that very surreal feeling that comes with finishing a lengthy mountain ‘day’ when everyone else is just starting theirs. May 2018: Finally, after four months of recovery, I’m allowed back in the mountains. My downhill muscles are pretty much non-existent, but I was very pleased to have managed a 6 hour day in the Drumochter Hills as my first attempt. Between March and May I learnt a lot about accepting my limitations and how vital it was to allow my knee to recover. I also learnt how to listen to my knee and to know when to push through discomfort or when to recognise that my knee was telling me that it really wasn’t happy. This was as much about managing my head as it was my injury. When the knee was back to its normal size, it was only really at that point that the physio was able to confirm that I’d been extremely lucky and that there was no damage to ligaments or tendons. Building back up to full fitness was now the challenge. July 2018: My knee stood up to this fairly hefty mountain day with only a few gripes and twinges. I will still have to work towards being able to carry a full pack with all my camping gear, but given the unevenness of some of the paths, the challenge of walking in limited visibility on the said uneven ground, the amount of ascent and length of day, my knee is pretty much there in terms of recovery. I’m extremely fortunate that there was no long-term damage. I’ve had to learn to be extremely patient and only push myself to do things when the knee was ready for it… both my head and impatience were clearly a major deterrent at the start of the recovery process. However, it wasn’t just the frustration of not being able to do mountaineering (or the other physical activities that are an intrinsic part of my life – such as riding and, to a much lesser extent, running), it was the being deprived of the wild outdoors environment that is so much a part of my being. I had to avoid looking west towards the distant hills for a few months and completely confine myself to Aberdeen and its environs. Here the riding saved me and allowed me at least that vital sense of being in touch with the world of forests and fields. So there we have it: Beinn a’Bhuird marks my return to a good level of mountain fitness. I’m still working on other areas (such as running and strengthening the knee for riding), but as long as I’m patient and sensible, I’ll get there. Recovery is a journey in itself. When the mountain forecast states: ‘Beware of dehydration, sunburn and heat exhaustion’, you know that it’s going to be a very hot day. Last week, with very warm temperatures (pushing around 30C in the Braemar area), Joan and I headed out for another navigation session. This mountain day came with a special request for a ‘special client’ (Harris the Dog). Harris needed to be kept cool, so it was imperative that we stayed close to water courses as much as possible. A route through Ballochbuie forest, handrailing a burn for the most part before heading out onto the open hillside (final destination Carn an t-Sagairt Mor) was planned. ‘Hot’ doesn’t even begin to cover it. Even in the shade of the trees walking was tough. There were several stops (by the water) for Harris to cool down, but also for us to rest. As we climbed higher and above the treeline, the heat became worse. No drop in temperature with gain of height today. No cooling breeze. We made it as far as the spot height at 727m, where Harris very patiently followed us around while we discussed slope aspect, before we decided it was simply too hot to continue – primarily for Harris, but also for our sakes. So back down to nearest water course we went, where Harris once again happily sploshed around, and then we beat a retreat back into the forest, where, yes, it was still extremely warm, but there was at least some shade and usually a burn close at hand. A final dip in the Dee, retrieving various sticks, clearly made Harris’s day, and although we may not have got up into the high mountains, our day of navigation had been successful. April and early May are perhaps the most precious time of year for me for getting out into the mountains: in a good year you can head out with lightweight gear and camp in the middle of nowhere….without then being imprisoned in your tent by a ravening horde of midges, scratching on the canvas (crooning ‘little pig, little pig, let me in’ … that’s when it gets really creepy) baying for your blood. Sure you can camp before spring comes and avoid them – but that then involves also carrying an axe, crampons, winter tent, and 4-season sleeping bag. OK, so any self-respecting mountaineer should be able to do this, but is it really all that much fun shuffling along like an over-laden mule? One way to cope is of course to set up a base camp somewhere convenient and then head up the chosen mountains; however, this then sacrifices the wonderful freedom you get from carrying everything all the time – the ability to go anywhere you choose and stop whenever you get tired or happen to find that perfect camping spot. So, there is often only a narrow window between when it starts to get warmer and the midges appearing – and this year looked to be an especially narrow window, with late snows and then pretty miserable conditions. A first attempt to head into Fisherfield at the start of May had already been thwarted by very heavy rain and strong winds. Even worse, that same weekend also saw the first of the midges up near Carn Ban….curses…and I had so been looking forward to trying out my new tent! Then, towards the end of May, a period of really promising weather rolled in – warm and sunny – and I figured that if I camped high enough then I could escape the midges. I had been out for a trial run a couple of weeks earlier, heading south from Laggan, over the ‘Creag Pitridh Three’ (does anyone ever remember the names of the other two hills on that circuit???) and over to ‘That Chain of Four to the NW of Ben Alder’ (again, their names don’t really spring to mind all that readily to most people: mention Carn Dearg and Geal Carn – red hill and white hill, respectively – and you could be referring to any number of hills in the Scottish Highlands!). I had been pleasantly surprised by the weight of my rucksack – light enough that everything could be carried up and over each mountain without it being unpleasant or making progress too slow. The bad thing with carrying everything (especially when you decide to add a few litres of water as you approach time for bedding down – after all, you never quite know if there will be water later on) is that you can hit the wall and lose all energy quite suddenly and have to stop. 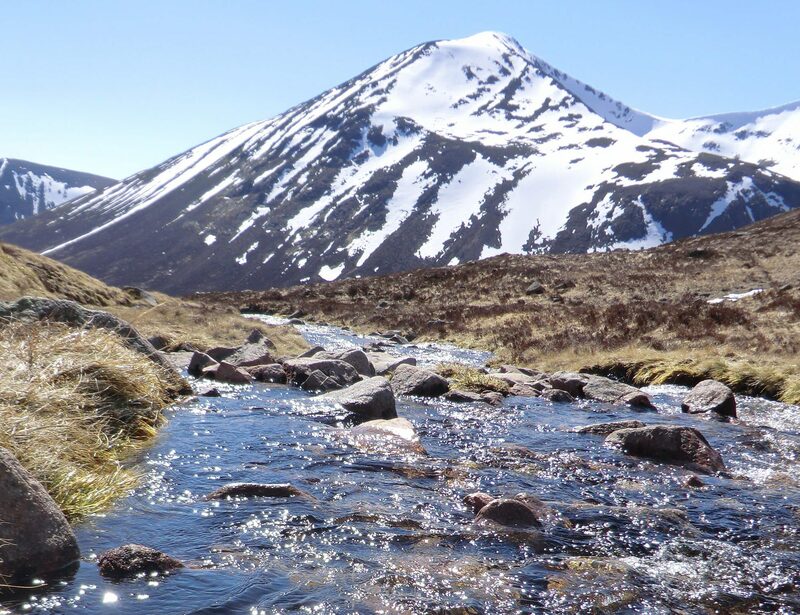 I was puttering my way down An Lairig – quite a find, a wide glen, with a lovely meandering stream and hills rising steeply for 2000 ft on either side – when suddenly I could go no further. Fortunately I found a perfect spot on a grassy patch surrounded by a loop of the stream. Unfortunately (I had heard it was difficult to get back in the bag) I had not tried out the tent beforehand, and was completely flummoxed by the instructions. I had watched a video of erecting it online and there was also a little card showing how it was done (pin the corners, slot the pole in and tighten: job done)…neither of which bore any resemblance to reality. The instructions did rather rely on the outer and inner already being connected, rather than one perfectly folded inside a pocket of the other. In my tiring state it took me about an hour. During this period the wind dropped and I prepared myself for the worst, having already seen midges up high on Creag Pitridh earlier in the day….but my fears were unfounded and none appeared. Clearly I was more tired than I had thought, as even a cup-a-soup tasted like soul food (and as for the cask strength whisky…!). Anyway, two weeks later, with the arrival of the good weather and a practise run under my belt, I headed for Rannoch station and, from there, got the train one stop up the line to Corrour (as featured in the movie Trainspotting….but we won’t repeat anything from that scene here!). I had been to Corrour years before and found a lovely little tea shop. It (The Corrour Station House) has now morphed into what, to me anyway, was an excellent little restaurant serving superb food…and drink. I decided to make my camp food last a bit longer by having fish and chips at the Station House – which was excellent – before starting out. Sadly, I also had a beer. ‘Sadly’ because I enjoyed it so much that it then preyed on my mind for the next 48 hrs until I managed to get back for another one. After that, somewhat grudgingly, I picked up my inexplicably now-overweight rucksack and headed off into the gloriously warm late-afternoon sunshine to climb Leum Uilleim (a Corbett). The plan had been to trundle down the far side, past the bothy, then round and up to a lochan at the bottom of the next target, Glas Bheinn (another Corbett) but I suddenly hit the wall a little short of the bothy and had to find somewhere to stop. Finding a campsite proved very tricky – there just wasn’t anywhere dry and flat. With so few good camping spots available, I decided it was worth just leaving the tent where it was for a couple of days. However, the real reason was that I was struggling with the weight. A quick inventory told me what was different this time. 1) Water filter: about 500 g – not gratuitous when camping lower down, and does mean you can carry less water at all times, needing only a tiny stream for a refill; 2) Pertex bivvy bag, again weighs about 500 g, but with a thin sleeping bag I had been getting cold two weeks ago and slept in all my clothes and jackets (plus insulted shorts and gloves) – with this over my sleeping bag I was nice and warm….but still had the same amount of clothing with me to ensure I could lounge around outside the tent or camp high; 3) change of clothes (so much more civilised when doing that lounging around when not wearing t-shirt and underwear that now contains three days of sweat; 4) ah, two things of antibacterial hand-gel (do I really then need a tube of antiseptic cream in my first aid kit? ), a little biodegradable shower gel (again, if being clean adds enough to your enjoyment, then is that too much of a price to pay? Trick is to fill a big container with water and leave it to warm in the tent all day), a little towel….hmm, not the smartest bit of packing there. Anyway, all these little things all add up and there was probably 3 kg of stuff I could have jettisoned. Next morning, with a mostly empty pack, I headed north up the glen – this was not the quick and easy walk I had anticipated and immediately suggested that I had messed up on my strategy by camping so far down the glen. Anyway, it was a lovely day and I headed up to Loch Treig, found the bridge and continued up to Stob Coire Easain. The previous day’s efforts seemed to have taken their toll and it all felt very hard work – so hard that I didn’t even go on to do it near neighbour, Stob Coire Mheadhoin (pronounced “Vane” by the way, in case you are wondering!). These are usually called ‘The Easains’, they are almost invariably done from the North, and it is almost unheard of just to do one on its own – but this was clearly going to be a long and exhausting walk back and it seemed sensible not to head any further away from the distant tent….so while I pondered matters, I had a little sleep on the summit and looked around a bit. The Easains are stunningly well-placed: you have the chain of the Grey Corries to the west, ending with the Aonachs and Nevis; to the south of there the chain of the Mamores starts; and to the south of there lies Glen Coe and even more stunning peaks. On the way back the problems started: not my blistered feet, tiring muscles and aching back, but the craving for a beer at the Station House. When I got back to Loch Treig I spent nearly half an hour sitting and deliberating – it couldn’t be much more than an hour and a half to the pub could it, and from there it wasn’t much more than a two and a half hours back up and over to my tent, was it? Fortunately common sense got the better of me for once and I took the direct route back up the glen. Amusingly I later spoke to someone who had the same thoughts as me but had been armed with a bike and thus cycled through to the pub (though I believe the beers did not sit all that well with him after that). Anyway, next morning nothing was going to stop me – a quick up and over to Glas Bheinn and back to collect the tent, before finding a suitable compromise between distance and altitude to get over Leum Uilleim again and down to the Station House….where I was greeted with a sign that said it was closed from 4.30 to 6.30 pm for a large party. To say I nearly cried would be an understatement. Fortunately I was just ahead of the 4.30 embargo and they were happy for me to eat outside (no complaints there, bit breezy but a stunning day) if I ordered immediately, and they indicated that keeping me supplied with drinks would not be a problem. After all that anticipation neither the food nor drink let me down (though the beers may have played a part in my later navigation errors). Once satiated, I headed over the Loch Ossian in the glorious evening sunshine – meeting lots of people staying in the youth hostel heading to the pub for their dinner – and promptly took the wrong path (aiming to take the main track back to Rannoch, camp at a ruin at 500 metres, zip up Carn Dearg the next morning, back down to collect tent, and walk back to Rannoch station). ….unfortunately, with those contact lenses in, I am unable to read fine details on the map (nothing to do with the beer, honest) and missed the start of the path. I could have slogged up through the heather and bog to reach it….I should have slogged up the muck to reach it. However, the map showed another path further along the loch side, so I would just do 2 sides of the triangle…after all it was a lovely evening and Loch Ossian was stunning. Never found the path. Eventually found a narrow path that took me up a little ways before it disappeared. After some choice words, I figured that my only option was to slog up the horribly steep and wet hill side, covered in waist-deep undergrowth, already tired from a long day, carrying an overly heavy pack, having had perhaps a little too much to drink, and climb Carn Dearg that evening. As I struggled up, finally reaching open hill side and less deep heather, I suddenly came across a narrow grassy ledge that was almost flat…and just big enough for the tent. Ten minutes later the tent was up and I was sitting looking out over Loch Ossian and Beinn na Lap, bathed in the still-warm evening sun, with views out to Ben Alder on one side and the Mamores on the other…and armed with a nice cold can of coke, bought in the restaurant for such times (wonder why I didn’t think to grab another beer…I suppose a heavy glass bottle would not have helped progress). Slight issue was a complete lack of water, which required a long wander around the hillside, listening intently for the gurgle of water. Eventually I found a hole to a tiny stream a metre down, through which I could lower the end of the tubing of the water filter (definitely worth the 500 g weight of bringing it along) and fill up bottles. Next morning I packed up and headed up Carn Dearg nice and early intending to continue down the long ridge to Rannoch station; however, a quick glance to the west to the Station House, combined with a few choice blisters on my toes, suggested the shorter way back, via Corrour, could be more appropriate. About an hour and a half later, I was persuading them that it would be really nice if they were to start serving hot food early and an excellent venison burger was on its way, as I waited for the train (sadly no beer though, as I would be driving once I exited the train). OK, so not exactly everyone’s idea of ‘Into The Wild’ (me included!) – but you have to admit that being able to wander mountains and glens so off the beaten track that you don’t meet a single person for four days, and yet orbit a splendid restaurant and pub does have a certain appeal to it!? [Note: ‘Into The Wild’ is a book by Jon Krakauer, later made into a movie, that recounts the true story of Chris McCandless, who gave away all his money and, after a nomadic existence, headed out into the wilds of Alaska, where his attempts to survive out in the bush failed and he met with his untimely death. A stunning midweek day out on the hill with Joan, practising the fine art of micronavigation … now all we need is a day of poor visibility to put those skills to the test!